The studio behind Witcher 2 might have a relaxed policy on DRM, but that doesn't mean it's going easy on pirates. CD Projekt revealed a ton of details on the future release of Witcher 2 last week, including the fact that it'll be released on the company's Good Old Games service with no DRM. However, CD Projekt wants those piratey types among us to know that this doesn't mean it should immediately be put up on a torrent website so that people can download it for free. If pirates decide to take such an action, the company might come banging on their doors. CD Projekt recently told Eurogamer that the studio's anti-DRM stance doesn't mean it's pro-piracy. In fact, CD Projekt is planning to take Witcher 2 pirates down a few notches by preparing legal action for any it can catch. "Of course we're not happy when people are pirating our games, so we are signing with legal firms and torrent sneaking companies," CD Projekt co-founder Marcin Iwiński said. 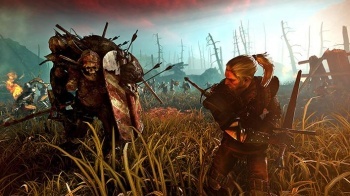 This means that CD Projekt plans to monitor illegal torrent downloads of Witcher 2 and fine those connected to it. "In quite a few big countries, when people are downloading it illegally they can expect a letter from a legal firm saying, 'Hey, you downloaded it illegally and right now you have to pay a fine,'" Iwiński added. Thankfully, he understands that catching pirates in the act, even when their IP addresses are snatched from a torrent connection, isn't easy. CD Projekt isn't going to go overboard here, but it wants to reasonably make the attempt to deter as many pirates as it can. "I'm sure you've heard about stories in the US when recording companies were chasing people," he continued. "We don't want to be so harsh, but there is a chance that this might happen to some people if they download illegally. There will be an initiative." Iwiński said that he believes "it is important that games companies use robust evidence gathering and legal processes to avoid encountering some of the bad PR which has resulted from litigation against innocent consumers elsewhere." In his view, "the whole point of these measures is that they should have a nil effect on legitimate games purchases but a strong negative effect on illegal downloads." I think CD Projekt has the right state of mind here. Recklessly suing alleged pirates whom potentially could be innocent, like other industries have done in the past, only creates bad publicity and arguably increases the desire that many people might have to engage in piracy. Making sure that pirates are caught red handed, and sending out a letter or perhaps a fine, still works to deter illegal downloads, while nobody can argue that a company is overstepping their bounds by doing so. Also saying "hey, we're watching" doesn't hurt either. Piracy has existed since we drove boats everywhere, and will continue to exist in its modern forms, but it's still worthwhile to make the effort to ensure that people know piracy is illegal, and that somebody could be watching.